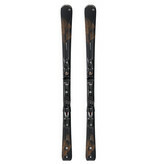 The all new Blizzard ALIGHT is a collection of women's skis specifically designed for groomed snow skiing. We specifically developed four different groups of technologies that optimize each Blizzard Alight model’s ability to deliver the perfect amount of Stability, Precision, Agility, and Control to every individual skier. Blizzard Alight will give you the freedom to do what you want when you want, the freedom to be the driver and not the passenger, the freedom to make your mark.